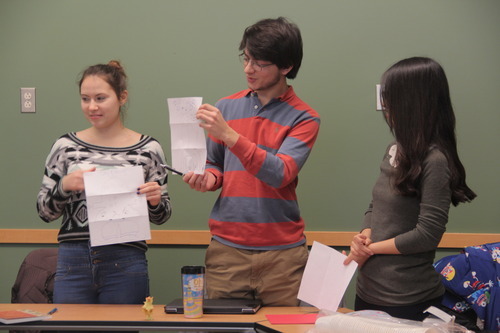 This week, we came together as teams and formulated our initial design challenges. To do this, we used several techniques and incorporated ideas of Wicked Problems and How Might We’s. Firstly, for our creative exercise, we created Monsters as a team and made background stories for each. For homework before the class, we assigned each person to a place so they could observe their surroundings and identify problems within that space. Teams came together for a Data Dump to share their observations. 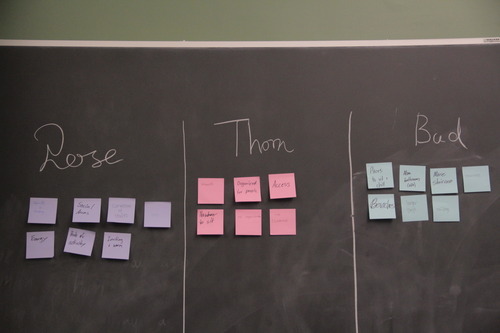 They then placed their observations on Post-its and categorized them according to the Rose/Buds/Thorns technique. We learned more about How Might We (HMW) questions and each team was given a chance to formulate their own. We used the Mix-and-Match Challenge activity to create the foundations of our HMWs and also remembered to incorporate ideas from the Rose/Buds/Thorns activity. These HMWs were then iterated on to create their final design challenges, which they will be working on for the next 4 weeks. For their homework, they’re tasked to come up with names and insignias per team (so they can bond as well!) and finalize their HMW so they can start on the next phase: Empathy! We started and ended our first design challenge. Mika Reyes headed the session for the day and tasked all participants to go through the Wallet Project. The Wallet Project is a short introduction to design thinking introduced by the Stanford d.School. It goes through all the phases of design thinking. 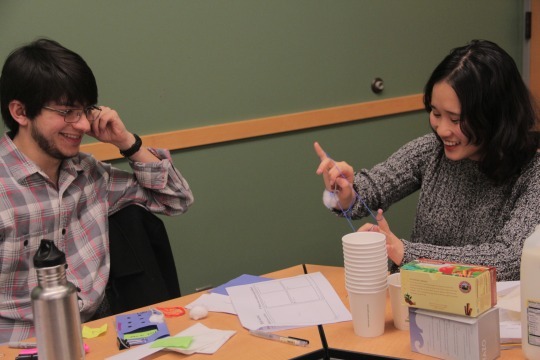 What better way to learn Human-Centered Design than to learn by doing? Participants empathized, ideated and prototyped new wallets for their partners and came up with amazing models at the end of the session. We all then shared and discovered a few new details about our fellow classmates. It was interesting to see how all the wallets were catered to so many different personalities — adventurers, travelers, highly organized individuals, not-so-organized people. The students came up with amazing prototypes and hopefully learned a lot by going through the process. After this little introduction to the methodology, the next weeks will be dedicated to going deeper into the design thinking methodology with new teams, new problems and new things to learn! Here’s the start of a new adventure with 3 pumped up student teachers, 12 motivated students and a handful of design challenges on the way. plus a interested others joined us in our first session where we discussed what was in store for the next semester. We also gathered suggestions and ideated on a few things the students wanted to potentially see or experience from the course. It’s all a team effort!